Something for Kate are a three piece band from Melbourne, Australia. The band are comprised of singer/songwriter/guitarist, Paul Dempsey, bass player, Stephanie Ashworth & drummer, Clint Hyndman. The band have to date released six Top 10 gold and platinum studio albums, a double album of B-sides, a double Best -Of album, a DVD, a live album, a video collection, three e.p’s, a book and too many singles to mention. Occupying a unique place in the musical landscape, the band have sold over half a million records in Australia alone and continue to make fiercely original and challenging records attracting what has been described as a cult- like following, while also gaining new and loyal listeners with each release. 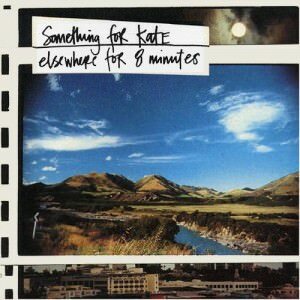 In 1996, Something for Kate signed to Murmur Records, an offshoot of Sony Music which was their home for 10 years. During this time the band toured endlessly throughout Australia as well as the US, Europe & Japan. They have toured with everyone from Death Cab for Cutie to David Bowie playing many major festivals also. They have been nominated for 16 ARIAS (Australian Record Industry Awards), achieved 6 platinum and gold selling albums, 5 Top 10 albums, taken out numerous awards for Best Live Band, Best Male Vocalist, Best Album, Best single from Rolling Stone Magazine, the Australian Music Industry Critics Awards,The Age Newspaper, Triple J to name just a few. Having completed their contract with Sony Music, in 2008 after touring for their final release for the Sony label,The Murmur Years – The Best of Something for Kate 1996-2007, the band signed to EMI/Capitol Records Australia. And in 2009, singer /guitarist Paul Dempsey commenced a solo career in addition to his work with Something for Kate and subsequently released his first solo album, Everything is True. The album was highly successful in Australia, entering the charts in the top 5 upon it’s release, surpassing gold status and being declared Album of the Year by iTunes amongst many other accolades. After relocating to New York in 2010, Paul Dempsey toured Everything is True until early 2012 when he commenced writing for the 6th Something for Kate album in Australia with bandmates, Stephanie & Clint. Something for Kate completed recording their 6th album in Dallas in May 2012 in Texas with producer, John Congleton (St Vincent, Explosions in the Sky, Modest Mouse ) The album is titled Leave Your Soul to Science and was released on Friday September 28th. The first single from the album, Survival Expert, was released on Monday August 6th, premiered on Triple J. The bands first shows in 4 years were also announced and presented by Triple J and sold out within 5 minutes. Leave Your Soul to Science debuted at Number 1 on the Australian ARIA (Australian Record Industry Association) chart and number 5 on the International ARIA chart. The band’s Leave Your Soul to Science national Tour, their first in 4 years was announced in August and promptly sold out every show with multiple shows added, also selling out. After releasing the singles, Miracle Cure and Star- Crossed Citizens, the band then commenced their national Star-Crossed Cities Tour in May and June of 2013, a 20 date tour that sold out right around the country. In 2014 the band celebrated 20 years since their very first show as teenagers at Melbourne’s Punters Club. To celebrate, they embarked on their 20th Year Anniversary tour, a national tour which promptly sold out theaters across the country whilst also releasing a book, a short film and re-releasing the bands entire back catalogue on vinyl. All 6 albums re-entered the ARIA chart selling out all pressings. After selected festival appearances, a joint headline national tour with You Am I and a national club tour in 2017, the band are currently writing album number 7. Stay tuned! After recording a 7 track demo in 1995,the band signed to Murmur Records, a subsidiary of Sony. Then in 1996, they released the 7 track E.P., “The Answer to Both Your Questions” recorded and mixed by Greg Atkinson of Sydney band, Big Heavy Stuff. In November of 1996,the 3 track single, “Dean Martin” was released. Early in 1997,the band then released a 5 track E.P. titled “Intermission” as they recorded their first album, “Elsewhere for Eight Minutes” in New Zealand and mixed and mastered it in New York with U.S. producer Brian Paulson. (Brian had previously produced albums for amongst others, Wilco, Archers of Loaf, Superchunk and Slint) Something for Kate’s first full length album was released in July of 1997. Bass player, Julian Carroll was then replaced by Toby Ralph who toured with the band for the release of this album. Four singles were released from “Elsewhere for Eight Minutes”. They were: “Captain(Million miles an hour)”,”Prick”, “Working Against Me” and “Roll Credit”. The album went on to achieve close to platunum status. Bass player, Toby Ralph was then replaced by Stephanie Ashworth in March 1998. The band then wrote their second album, “Beautiful Sharks” which was released in April of 1999. “Beautiful Sharks” was recorded in Melbourne, once again by producer, Brian Paulson. Four singles were released from “Beautiful Sharks”. They were: “Electricity”, “Hallways”, “Whatever You Want” and “The Astronaut” When the band went on the road with this album they took on an extra touring musician, Wally Gunn to play the incidental guitar and keyboard parts. Beautiful Sharks debuted at No.8 on the ARIA chart and achieved platinum sales. In 2000 as the band were writing for their third album, Murmur released “Q & A With Dean Martin”, a re-release of the bands first E.P. and single as they had since sold out of their pressings and were increasingly difficult to come by. Also released in 2000 was “Big Screen Television”, a video collection of 12 of the bands music videos along with some bonus footage. Then in June of 2001, Something for Kate released their third album, “Echolalia”. Produced by the band and Trina Shoemaker whose other recording credits include Queens of the Stone Age, REM, Whiskeytown, Sheryl Crow, “Echolalia” was recorded at INXS bass-player, Gary Garry Beers’ Mangrove studio in the Central Coast of NSW. Four singles were released from “Echolalia”. They were; “Monsters”, “Three Dimensions”, “Twenty Years” and “Say Something”. When touring this album, the band then took on two touring musicians, Pip Branson and Simon Bourke, again, to play the increasing amount of keyboards and extra guitar parts featured on the album. Echolalia debuted at No.2 on the ARIA charts and was pronounced double platinum, the band’s highest selling record so far. In 2002, the band released their first DVD, entitled “A Diversion” which is a document of the writing, recording and touring of the “Echolalia” album. In 2003 the band recorded their fourth album, “The Official Fiction”. Produced once again by the band and Trina Shoemaker at Mangrove studios, “The Official Fiction” (released in Australia in August 2003), spawned the singles, “Deja vu”, “Song for A Sleepwalker”, “Best Weapon” and [& Moving Right Along”. The Official Fiction debuted at No.1 and has so far achieved over platinum sales. After supporting David Bowie on the Australian leg of his ‘Reality Tour’, the band toured Europe in 2004 taking in Germany, France, Denmark, Scotland, Ireland and the UK before returning to Australia to release their first Double album, “Phantom Limbs- Selected B-Sides”. This release is a collection of the band members and their fans favourite b-side tracks from over the years. Upon returning to Australia in the latter part of 2004 the band spent the remainder of the year writing and demoing songs for their 5th album. After completing this demo process in mid 2005, the band then went to Los Angles to record album no.5 with U.S. producer, Brad wood whose recording credits have included everyone from Chicago post-rock band Tortoise, Red Red Meat, Liz Phair, Pete Yorn, The Smashing Pumpkins to Ben Lee. Emerging 4 months later with the finished album, the band then released the 1st single in on May 6th, “Cigarettes and Suitcases” from the forthcoming album, “Desert Lights”. “Desert Lights” was released on the 1st July 2006 and debuted at No.1 on the Australian chart. It was pronounced Gold in the first week. The band toured the album nationally and then released the following 2 singles from the album, “Oh kamikaze” and “California”. After much touring within Australia throughout 2006 and then the 2007 Big Day Out tour, Homebake and numerous other festivals the band then went into the studio and recorded a brand new single titled “The Futurist” to feature on their first Greatest Hits-type record – the double album, “The Murmur Years- The Best of Something for Kate 1996 – 2007”. In August of 2007 “The Futurist” was released as an iTunes only single and “The Murmur Years” was released on August 18th. The band toured nationally in September of 2007 to celebrate this release. In February of 2008 the band then released their first live album titled ‘Something For Kate – Live at The Corner’. It was recorded live at The Corner Hotel in Melbourne on Saturday February 23rd, in conjunction with New Found Frequency, a limited edition Artist Controlled Bootleg which was available to purchase the same night- minutes after the performance. This release has since sold out. After doing various festivals and selected shows in 2008 the band took some time off while frontman Paul Dempsey concentrated on writing his first solo album. In May 2009 the first single from the album titled ‘Out the Airlock’ was released exclusively via itunes. In August 2009 Paul Dempsey’s first solo album,Everything is True was released. The album, debuted at No. 5 on the ARIA chart, was nominated for 5 ARIA Awards, acheived gold status, was named the iTunes Album of the Year and saw Paul sell out every show and tour he embarked upon. Paul relocated to New York in 2010 to release and promote & tour Everything is True whilst starting writing for the 6th Something for Kate studio album. In 2012, Paul returned to Australia to comple the writing of the new album with SFK bandmates, Stephanie Ashworth & Clint Hyndman. The album, titled Leave Your Soul to Science, was released on 28th September 2012 and debuted at Number 1 on the Australian Aria Charts. The album has so far spawned 3 singles, Survival Expert, Miracle Cure and Star-Crossed Citizens. The band continued to tour the album with 2 sold out national tours undertaken and a string of festival appearances. In mid 2014 Something for Kate celebrated 20 Years since the band formed in high school in 1994 with a massive sold out national theatre tour, a book, and a film.